So the first official stop on my Cambodian trip was Phnom Penh, but as we're spending another night there at the end of this trip, I thought I'd leave it all for one post later on. 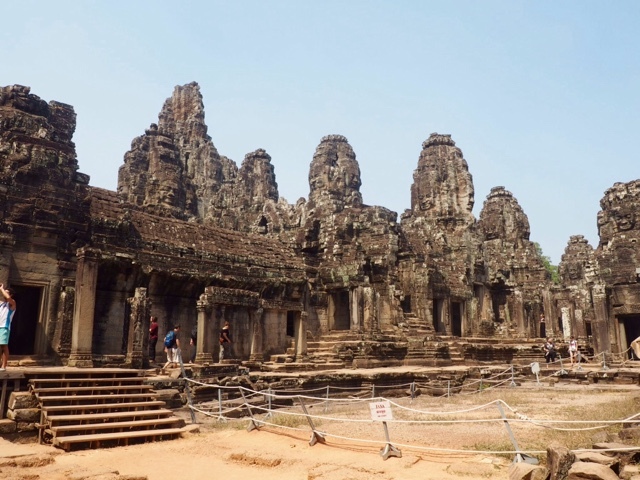 The next stop was Siem Reap, the most popular tourist destination in Cambodia, due to its proximity to the famous Angkor Wat, as well as numerous other temples. To get there from Phnom Penh, we braved a night bus. I've heard a few slightly scary things about Cambodian roads and buses, but this was the Giant Ibis bus, which had the best reviews online. And while it was by no means luxurious, it wasn't terrible either. The seat were reclined to a slight angle, and everyone got a pillow, blanket and bottle of water. It was a bit of a bumpy journey to try to sleep on, though I think a lot of other passengers had better luck than I did. My biggest problem was that I was too tall for the seats! I had to have my legs curled all night, apart from when I occasionally stretched them over the edge of my seat (we were on the top deck, right at the front), and I have to sleep on my side or my stomach, never my back, which left the seatbelt digging in rather uncomfortably. But overall, compared to my expectations, it wasn't a terrible experience! So we arrived just outside Siem Reap at 6am, where we were met by hordes of tuk tuk drivers (the standard mode of transport, taxis are a rare sight, other than at Phnom Penh airport). We were given a driver pretty quickly, and tuk tuks are lovely to ride in, whizzing along in the open air - although it's pretty cold at 6am! However I was rather concerned about our driver setting off when he clearly had no idea where our hostel was, and had to keep stopping to call them and figure out where he was going! He then offered his services to us for the whole day, which is fairly necessary as the temples are several kilometres out of town, and our hostel was quite far from the town centre. We ended up using him for all three days we were there, which was very handy, and Matt (my travel buddy) took a great liking to him. I was slightly less enamoured, as he never seemed particularly cheery, and I felt we were over-charged a bit, though we did get a lot of good use out of him. Our hostel, Bambu Stay, was further out of town than we had realised, hence needing the tuk tuk a lot, but it was very nice for a hostel! Everyone slept in a long barn-like building, but there curtains to separate the beds, so it felt like we had our own room. And we each got a very comfortable double bed! The only downside was how noisy it was, largely due to the loud music and fireworks of Lunar New Year late at night, dogs barking through the night, and the sounds of children and building work from first thing in the morning. We arrived so early in our first day though, that there was loads of time to do stuff, so we headed off to get our temple passes - there's 1, 3 or 7 days available, so we got the 3 days for $40. 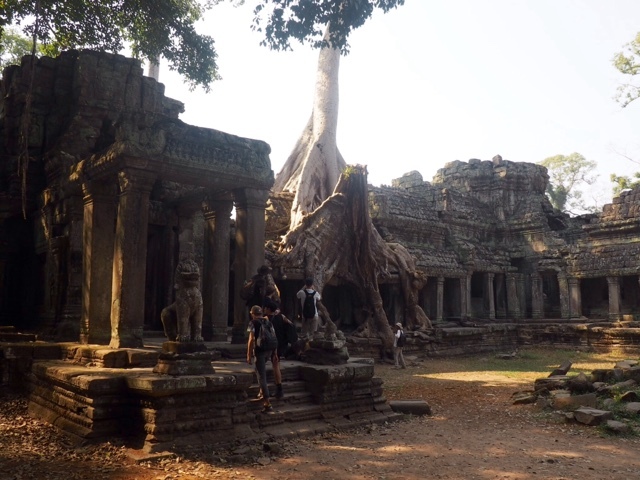 The first one we visited was Ta Prohm, well known for being featured in the Tomb Raider movie. This isn't the only Angelina Jolie connection we came across either! She has lots of links to Cambodia and visits a lot, but the best thing we came across was the Red Piano restaurant sells a Tomb Raider cocktail that she created, with pictures of her in the menu. Anyway, Ta Prohm is pretty impressive with the trees growing up through the stonework, a testimony to just how long the temples have stood there. They're probably the most iconic part of this temple structure too - while there are many similarities between all the ones we saw, they're also all unique in some way. 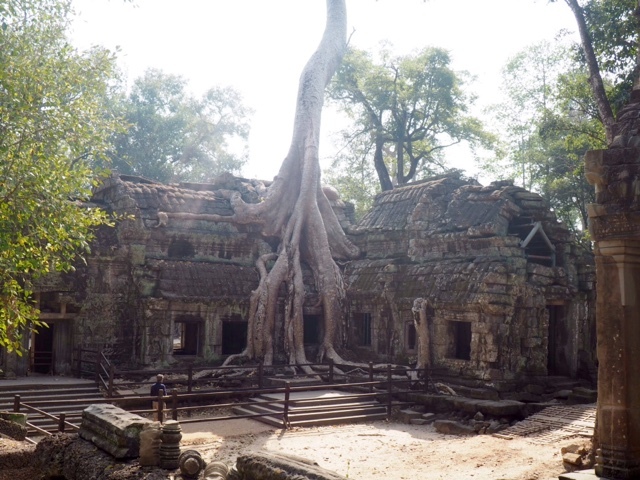 Ta Prohm is sometimes referred to as the jungle temple, being so well absorbed into the trees. We also went next door to Banteay Kdei, one of the less well-known temples. While it was still amazing, it wasn't quite as exciting as most of the others we saw. There's so much symmetry in the architecture of these sites though, and this one has lots of columns up its passages, almost Greek in style, despite being on the other side of the world. 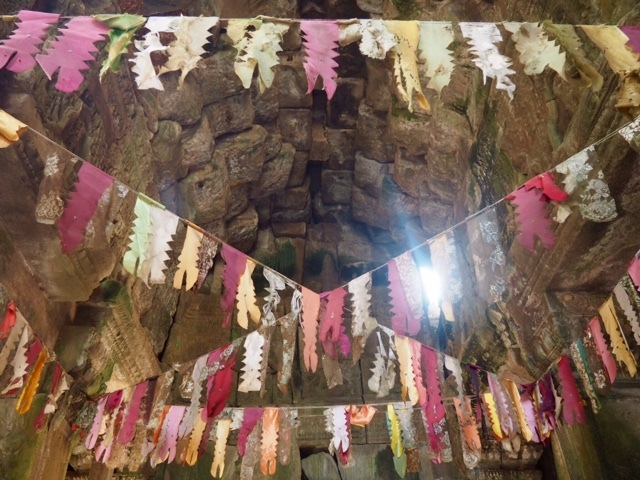 Many of the temples, including this one, have Buddha statues inside, draped in colourful (usually gold) cloth, but I found this to be a bit gaudy and cheap looking when surrounded by the ancient, simple beauty of the stonework. There are carvings everywhere that you could pour over for hours, many featuring Buddhas, and I think the bigger statues would be resplendent enough without being dressed up. Irritatingly, I began to feel ill on only my second day in Cambodia, and it has persisted for several days now, so I couldn't approach each day with all the energy and enthusiasm I normally would, and we spent a large chunk of the afternoon back at the hotel, resting. It is our holiday too though, and we need time to unwind! We had both lunch and dinner on Pub Street though, endlessly popular with tourists. It's a short street, entirely lined with restaurants and bars, and rammed with hordes of tourists, the result being a very Westernised street. There's plenty of good food to be had on it though, and we had Khmer, Vietnamese and Western cuisine during our visits. Two of our friends from Hong Kong were also in Siem Reap, though had got there a few days earlier, so we met them for dinner, and they told us about their favourite temples so far, which were still on our list. There isn't a whole lot else to see in Siem Reap itself, beyond the night market by the river, which is pretty small really. The town is mainly a base for visiting Angkor to most people, including us. The next morning was when some of the real adventuring began. We stumbled into our tuk tuk at 5am, which whisked us off to the temples again. We made the pilgrimage through the darkness, alongside hundreds of others, torch lights guiding the way - and being extra careful when we realised we were crossing the most and there was nothing to stop anyone falling in! - until the crowds had settled on the banking, and waited. Slowly, slowly the silhouettes of spires began to emerge from the black, and the skies began to shift through a spectrum of colours - smoky red to burnt orange, to dusky pink and golden yellow, until the blue of the morning appeared. All with the temple emblazoned across it all, becoming more visible with each passing minute. We were there for maybe an hour in total, and while it's difficult to have a truly spiritual moment there, with the hordes of other tourists around, their damn camera sticks waving around in the air, and the numerous locals trying to sell breakfast and hot drinks, it's still absolutely an experience worth having. Angkor Wat is the most impressive temple from the outside, with its sheer size and magnificent spires, and knowing that it has stood there for hundreds of years is so humbling. Definitely a moment to remember. We went straight back to the hostel after the sunrise, for a few extra hours of sleep, and since I was feeling ill again - we even did a pharmacy stop on the way back so I could stock up and try to recover. This actually turned into us oversleeping an hour later than we asked our driver to come back, so we found him outside taking a nap in the tuk tuk. The hostel receptionist woke him for us, giving him quite the fright in the process! 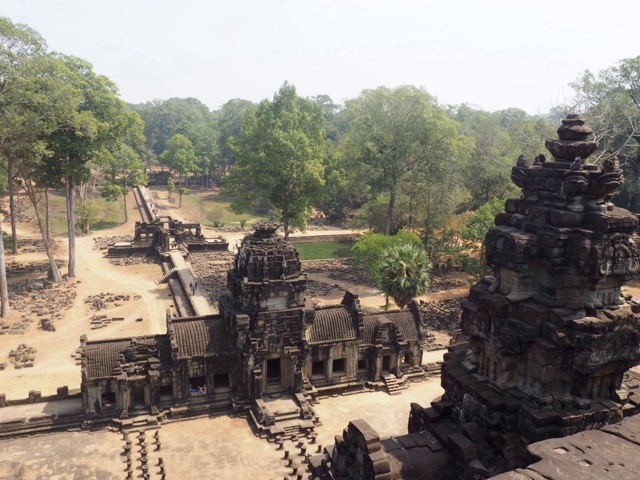 We drove back to Angkor Wat, to actually explore the whole temple by daylight. I proved myself to have terrible luck with tuk tuks on the way though, as my hat blew off and I had to get him to stop while I ran back for it. This becomes even funnier though when I tell you that the day before I had to do the exact same thing when I dropped the lens cap for my camera... We were nearly taking bets on what I'd drop out the tuk tuk on the third day, but luckily I kept hold of everything that time! 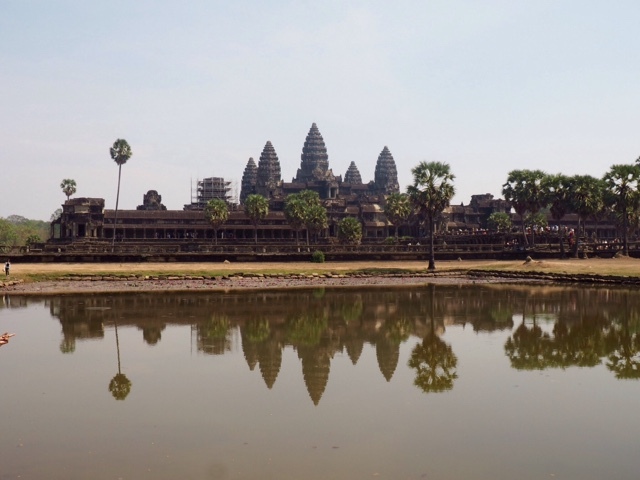 Angkor Wat was no less spectacular by daylight either. It's massive size makes it the most famous of the temples, as well as that iconic structure, captured even more beautifully with its reflection in the pool next to it. It's also one of the only temples not surrounded by jungle now, due to the wide most surrounding it, so it's easier to see how impressive it is. Spires stretching skywards, well-preserved and highly detailed carvings, numerous passages and archways to explore. You really get a sense of its size if you climb up to the Bakan, the highest level, which only allows limited numbers to enter at once. I wasn't sure if I'd make it up at first, as I had a funny light-headed turn as we were waiting in line and had to sit in the shade for a good 15 minutes or so. I rallied though, and up we went, discovering more chambers and ancient carvings, and views all the way back to the entrance arch and the moat, making me very glad I managed the climb. Though this is a good warning for anyone visiting any of the Angkor ruins - many of them do require a bit of physicality, with lots of walking and climbing involved. 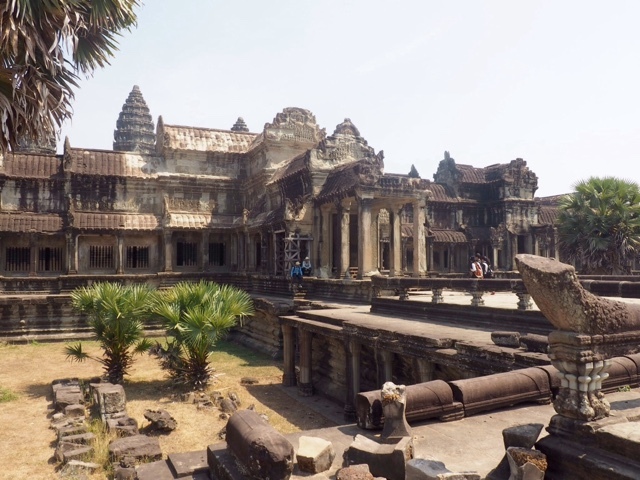 I had heard that while Angkor Wat is the most famous, it's not necessarily everyone's favourite, but I certainly couldn't deny how impressive it was. Parts of the interior were similar to some of the others, yes, but that exterior is so beautiful and well-preserved, and will always be memorable and iconic. We then went on to visit Angkor Thom, the site which covers the largest area, but none of its individual buildings beat Angkor Wat in size. We got lunch first, at this row of tiny restaurants, which consist of basic tables and chairs under a canopy, and a group of local women take your order and cook your meal. It's fairly basic fare, but it's local and properly cooked, and did the job. We were able to see around half the site in the remaining time we had, mostly the smaller areas, leaving the main temples for the next day when we knew we'd be back. We walked along the Elephant Terrace, aptly named for its carvings and elephant shaped pillars, and visited Preah Palilay, which is another site with a rather impressive tree growing through the ruins, and when you climb its steep stairs, you find piles of loose rock inside (as can be found throughout Angkor), which make you feel like an explorer yourself! On the drive back out from the site, we noticed lots of monkeys scampering around the grounds, who clearly seemed unfazed by all the tourists and traffic around. I always find it much better seeing animals in the wild like that (even if they are adapted to humans) than those in zoos. I was less thrilled about the elephants we saw though. I mean, seeing elephants is amazing, but these were being used for rides, which involves varying degrees of cruelty towards the animals, and I will never take a ride on one. We had dinner on Pub Street again, where I watched Matt demolish a 7 meat degustation menu at a Cambodian BBQ restaurant, meaning you cook it yourself on this massive metal dish, whose edges are filled with boiling water to cook the noodles and vegetables at the same time. It was while we were out that we began observing the motorbike custom again. Cambodia is swarming with motorbikes everywhere we've been, and it's become clear how much the people are raised riding them, having seen fairly young children drive them themselves. That evening I saw a mother driving one handed, while holding her baby in the other - and here's us with our dozens of regulations about the use of car seats for the child's safety, and these kids are basically being held under one arm! There was also a child, around 3 or 4, who was taking the utmost delight in honking their bike's horn. It honestly looked like it was the greatest pleasure in his life! On our final day of temple exploring, we had a slightly later start, sleeping in until 10am, though it still felt like a struggle to haul ourselves out of those comfy beds. It made for an interesting breakfast though, as the children of the family who run the hostel were up and about, and came to sit with us while we ate, 2 girls and a boy. Their English was limited, but they said hello and then said phone when they saw mine, though they pronounced it like "ph-1" so it took us a minute to understand. The girls managed to lock mine for a minute, being unable to get the passcode right, while Matt introduced the boy to whatsapp voice notes, and he was then even more amazed to hear his own voice saying hello playing back out of my phone, and got me to hit replay over and over. Eventually their mother came and sent them away, but it was all pretty adorable. We saw the girls again the morning we left, when they shows off their other English phrases: "Bye-bye, I love you!". After breakfast we went back to finish seeing Angkor Thom, starting with Bayon, it's most impressive site. This is the temple that makes you feel like a real explorer, as there's so many paths to explore and places to climb up. Every other turn offers a choice in direction, and it would be quite easy to become disorientated. The uppermost level puts you in the midst of dozens of spires with faces carved into them, and I think some of the carvings there were the best preserved and most detailed we'd seen. There's some particularly impressive long images taking up stretches of wall. We must've have spent at least an hour scrambling over the stonework there. Baphuon was our last stop in Angkor Thom, a huge square pyramid-like structure, that leaves you pretty exhausted after climbing up all those stairs. Our other friends in Siem Reap said it was partially closed when they were there because - who else - Angelina Jolie was filming there (as the director, not acting), but there was no sign of her during our visit, meaning we got access to all of it. The view from the top is particularly good, as you look out over the long raised walkway leading to its entrance. We went back to the same little restaurants for lunch, it being a far easier option than going back to town to eat, then coming all the way back again. There was plenty of choice to mix up our orders this time too. I then got to watch Matt try on at least 8 different hats from one of the nearby local stalls, as he felt he was getting too much sun, despite admitting he's not much of a hat person. I was thoroughly glad I'd already bought one in Hong Kong to bring with me. The poor man who owned the stall couldn't put them back as fast as he was trying them on, and I ended up laughing at a lot of them, as they looked very cowboy-ish. In the end, after trying on most of them, he bought the first one! 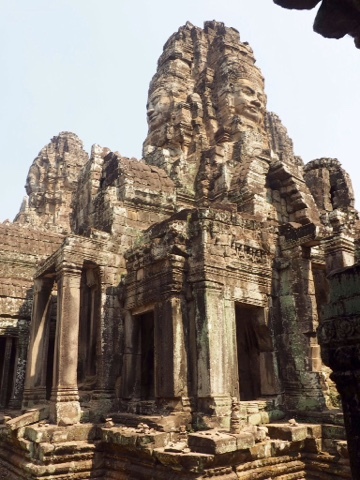 We then decided we could do one more temple, before we'd be all templed-out for this visit, so we headed to Preah Khan, next door to Angkor Thom, and one we'd heard good things about. It was also fairly impressive, being far larger than we initially realised. The entrance was lined with statues which all seemed to be pulling or holding a snake, as there was at the entrance to Angkor Thom too, though only about 7 of these ones still had their heads intact! Throughout the temple were these little piles of stones balanced on each other, which reminded me a lot of Scottish cairns, only much smaller. I intended to look up what they were about, but haven't yet... We ended up going down a side passage, and discovered just how wide the temple was too, and it then led us down a path through the forest, to circle round to the back of the temple. This was arguably the better end though, as there was another massive tree growing out through the stonework. Although we'd seen several trees like this, it's no less impressive each time, as it reminds you just how insanely powerful nature is, when left untouched by humans. We had one last dinner on Pub Street that night, meeting up with our friends again. We chose the Red Piano, which is Western and Khmer cuisine, and home to the Tomb Raider cocktail, though none of us tried it. We were lucky enough to get a table upstairs by the window, which looked across to another bar, where a live band were playing. We thoroughly enjoyed getting to watch and listen to them as we ate! Then we all had to head home, as we were all leaving the next day, them to Vietnam, and us to Battambang. 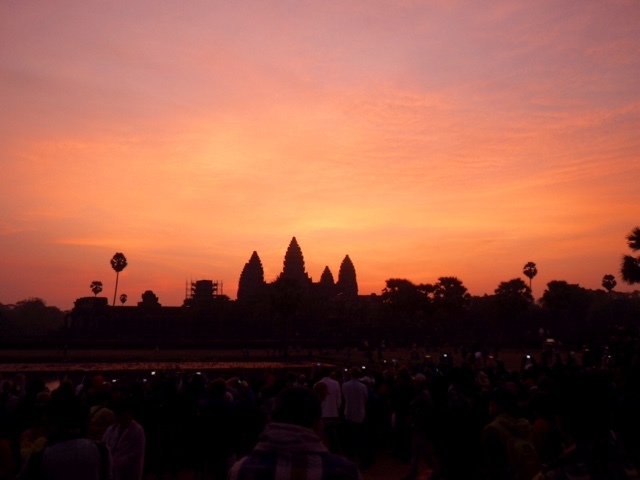 Overall, the temples of Angkor were just as amazing as I had been led to believe, and moments like the Angkor Wat sunrise are ones I hope I always remember - though hopefully I'll forget how ill I was feeling at the time. There's a good reason this is Cambodia's most popular destination, and even with the crowds (which were admittedly not as bad as I expected, given that it was Lunar New Year), it's absolutely worth it.